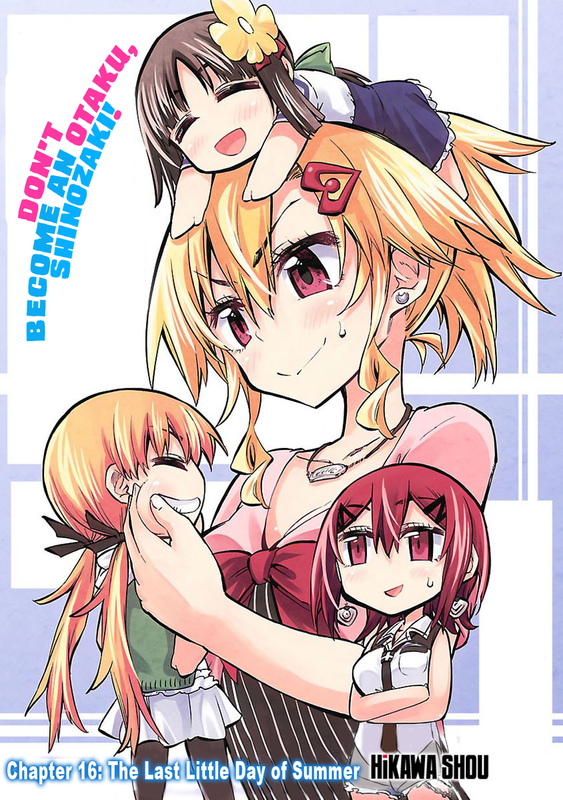 Shinozaki-san – Chapter 16 Released! It’s been quite a while since the last chapter, hasn’t it? But at long last, it’s time for more Shinozaki!!! I’m commenting just for the sake of the prince of bakumatsu thing. It could also be a mix-reference to Prince of tennis as well as a new anime called Bakumatsu Rock. I could be wrong, but just wanted to point it out. It has nothing to do with Bakumatsu Rock. Both of them refer back to the actual Bakumatsu period, which as I said is a common setting for BL stories. It MAY have something to do with Prince of Tennis, because that was a very popular series amongst fujoshi, but it seems unlikely, because there’s nothing tennis has in common with samurai, none of the characters look similar or have similar names. Thanks for the chapter! Akina totally let herself get gypped out of a rare Orange x Green figurine all because of her pride, this time. I guess it isn’t *too* bad since Konatsu got to deepen her relationship with her friends, and encourage Akina’s character development too. I’ve already got Vol. 3 on preorder since a couple weeks ago (along with a huge order of other books, like the entire Marimite novel series) as well. Unfortunately the order got delayed due to some of the Marimite books being out of stock (and needing to be backordered)… nonetheless, I’m looking forward to it arriving. I adore this manga, and you do a professional-quality job with it. When will the next chapter will be released? Pretty soon. About a week I’d say.